In many ways, this reads like a companion piece to (or a continuation of) Slouching Towards Bethlehem, a collection of Didion’s essays published in 1968. Here we have another volume of non-fiction pieces exploring various events and reflections in the author’s life during the late ‘60s and early ‘70s, all expressed in Didion’s effortlessly cool and erudite style. Like the essays in Slouching, most of these pieces had previously appeared in journals/magazines before being collected together in one volume. As I’ve already written at length about Didion’s non-fiction in my review of Slouching, I’m not planning to go into a lot of detail about the twenty essays in The White Album; instead my aim is to give you a brief flavour of the book, mainly by way of a couple of quotes that I noted while I was reading the collection. The essays included here cover a fairly diverse range of topics from Georgia O’Keeffe’s artworks to Ronald and Nancy Reagan’s former home in California to a recording session with The Doors. Running through many of these snapshots is a sense of social fragmentation and disintegration, a deep-rooted feeling of unease that seems to have characterised Didion’s life, reflecting both her own state of mind and her view of the broader cultural environment in California at the time. In the following passage – taken from the opening piece, The White Album – Didion is reflecting on the mood in LA in the summer of 1969, just before the brutal murders at Sharon Tate Polanski’s house on Cielo Drive. While Didion is always clear-eyes and insightful, in some respects she is at her best and most affecting when her reflections touch on the personal, the events and circumstances which have had a profound impact on her own life and ability to function. She writes openly about her relationship with migraine, a debilitating condition she has learned to accept and cope with in spite of its intensity and frequency. There is also the time when she is diagnosed with multiple sclerosis, a moment that pulls into focus her own vulnerability and sense of mortality. Through these highly compelling essays, Didion seems to be saying that there is little use in us trying to look for too much reason or narrative in our lives as reality simply doesn’t operate that way – sometimes we just have to accept the randomness of events or developments however unsettling that may be. Described by some as a companion piece to Ethan Frome (reviewed here by Max of Pechorin’s Journal), Edith Wharton’s Summer is a powerful novel set in North Dormer, a small, insular village in the New England region of America. While I didn’t love it quite as much as Ethan, I did like it a lot. The story focuses on Charity Royall, an impulsive and independently-minded young woman who lives with her guardian and widower, the dour and surly Lawyer Royall. As a young child, Charity was rescued from a bleak life with a group of outcasts from the nearby Mountain, a structure whose ominous presence looms large over North Dormer and Charity’s existence there. Charity feels little affection or gratitude towards Lawyer Royall for his earlier actions; if anything, she resents being constantly reminded of the need to be grateful to her guardian for the lifestyle he has provided, away from the feral nature of the Mountain community. Even her name is a reflection of her questionable status in society, a signal of her reliance on the benevolence of other, more ‘rightful’ citizens in the village. Thankfully, Charity has already managed to thwart a sexual advance and proposal of marriage from Lawyer Royall, thereby asserting herself as a strong presence in the red house, the home they share in North Dormer. Charity longs to escape from the boredom and constraints of her drab life in the watchful village, her only respite being a part-time job in the deathly quiet memorial library where she hopes to earn enough money to strike out on her own. So, when the handsome and kindly architect, Lucius Harney comes to town to make a study of the local buildings, young Charity’s passions and restless nature are promptly aroused. What follows is a sequence of encounters in which Charity wrestles with her feelings for Lucius, an educated man who belongs to a completely different social class from her own. There is a sense of blossoming and awakening in Charity as her relationship with Lucius develops and deepens with each additional meeting, particularly once it is agreed that she will act as his guide. In addition to the sense of emotional growth described above, the novel also touches on themes of identity, belonging, society’s expectations of women, and the difficulties of bridging a class divide – especially given the relevant period and setting. While I don’t want to say too much about the plot, there is a certain inevitability to the novel’s narrative arc as the story reaches its poignant conclusion. Nevertheless, there are a few glimmers of hope towards the end, particularly once Lawyer Royall is revealed as being somewhat more sympathetic and compassionate than might appear at first sight. The novel also contains some beautiful descriptive passages, fragments that act as reflections of Charity’s fondness for the open landscape and natural world. I’ll finish up with one of these, but there are many more to be found in the book itself. The White Album is published by Farrar, Straus and Giroux, Summer by Oxford World’s Classics; my thanks to the publisher for the copy of Summer. Ali and Simon have also reviewed Summer – just follow the links if you’d like to read their reviews. This entry was posted in Book Reviews, Didion Joan, Wharton Edith and tagged #ReadWomen, Classics Club, Edith Wharton, Farrar, Fiction, Joan Didion, Non-fiction, Oxford World's Classics, Straus and Giroux, US on October 23, 2018 by JacquiWine. The book comprises three sections: Life Styles in the Golden Land; Personals; and Seven Places of the Mind. One element that runs through several of the pieces, irrespective of their central theme, is a palpable sense of place – nicely illustrated by this passage from the opening paragraph of the first essay in the collection, Some Dreamers of the Golden Dream. Some Dreamers is an account of love and death in the golden land, the story of a marriage that has broken down, a woman who was tried for murder and judged for perhaps wanting too much from life. It’s a haunting piece, underscored with a sense of the dissolution of the American Dream. Didion is particularly good on the eerie nature of Las Vegas, a place where the notion of time, at least in the traditional sense, does not seem to exist. In Marrying Absurd, she writes about the commercialisation of the marriage business in Vegas, the nineteen wedding chapels that compete with one another, each offering bigger, better, faster, more ‘genuine’ services than the next – the implication being that the addition of candlelight or a free phonograph record of the ceremony will somehow make the wedding feel more authentic, more sincere. Elsewhere in this collection, Didion reveals her fondness for Hawaii, a place that moves and touches and saddens her like no other, stimulating her senses in the process. In many respects, she finds it a troubling island, one where the legacy of war runs far and deep. Other pieces in the collection focus on particular people, various cultural figures from the sixties: iconic individuals such as John Wayne, whom Didion visits on the set of The Sons of Katie Elder; Joan Baez and her ability to engage with a generation (‘She was the right girl at the right time’); and Howard Hughes, a man renowned for his idiosyncratic behaviour. At the time, there were endless stories about Hughes, passed around and traded ‘like baseball cards’. As far as Didion sees it, the fact that we have made a folk hero of this man – someone who actually represents the complete opposite of our traditional heroes – tells us something interesting about ourselves. She argues that the real point of money and power in America is not the obvious one (the things that money can buy and the buzz to be gained from flexing one’s muscles); rather it is the ability to facilitate personal freedom, mobility and privacy that is important. This is the real deal. Other personal essays in the collection cover Didion’s reflections on morality, self-respect and going home to her family in the Central Valley of California. In Notes from a Native Daughter, she writes vividly about what it is like to come from Sacramento, one of the somewhat insular valley towns in the heart of the state. She describes a town that had grown up on the farming industry only to discover (much to its shock) that the land could be put to more profitable use – certainly as far as the wider world of the 1950s was concerned. In this elegiac piece, Didion mourns the passing of several things: the passage of time; the various changes to the town over the years; the loss of connections with the old Sacramento; the loss of people with the knowledge of how things used to be. I mentioned earlier the strong sense of place that runs through many of the pieces in this collection. Before I finish, I’d like to highlight another couple of common themes, the first of which revolves around some form of social fragmentation or disintegration. It’s there in several of the essays I’ve discussed so far; and it’s also present in the titular piece, an account of the time Didion spent in the Haight-Ashbury district of San Francisco where she hung out with the street kids, the movers and shakers in the neighbourhood. This was a time when she observed first-hand the atomization of a society. In this piece, Didion offers the view that at some point from the mid-1940s to the mid-1960s, we had failed to take care of these children, failed in our duty as guardians and protectors. As a consequence, the children of Haight-Ashbury seemed less in rebellion against the society than uninformed about it. The final theme I’d like to highlight is a feeling of anxiety or unease, a quality that underscores many of these pieces. Once again, this is apparent in some of the essays I’ve already covered. It’s even there in a brief passage on the Los Angeles weather, the hot, dry Santa Ana wind, a foehn wind with the potential to create both physical and mental turmoil in the city. I’ll leave you with a final quote which is taken from Los Angeles Notebook, one that seems to capture something of this palpable sense of angst. Slouching Towards Bethlehem is published by Farrar, Straus and Giroux; personal copy. This entry was posted in Book Reviews, Didion Joan and tagged #1968Club, #ReadWomen, Book Review, Classics Club, Farrar, Joan Didion, Non-fiction, Straus and Giroux, US on October 31, 2017 by JacquiWine. On the evening of 30th December 2003, Joan Didion sat down to dinner with her husband and fellow writer, John Gregory Dunne, at their home in New York. Moments later, John experienced a massive coronary event that was to lead to his death. At the same time, the couple’s only child, Quintana, was lying unconscious in an intensive care unit at the Beth Israel North Medical Center in the city. She had been there since Christmas Day when, what had at first appeared to be a case of flu, suddenly morphed into pneumonia and septic shock. 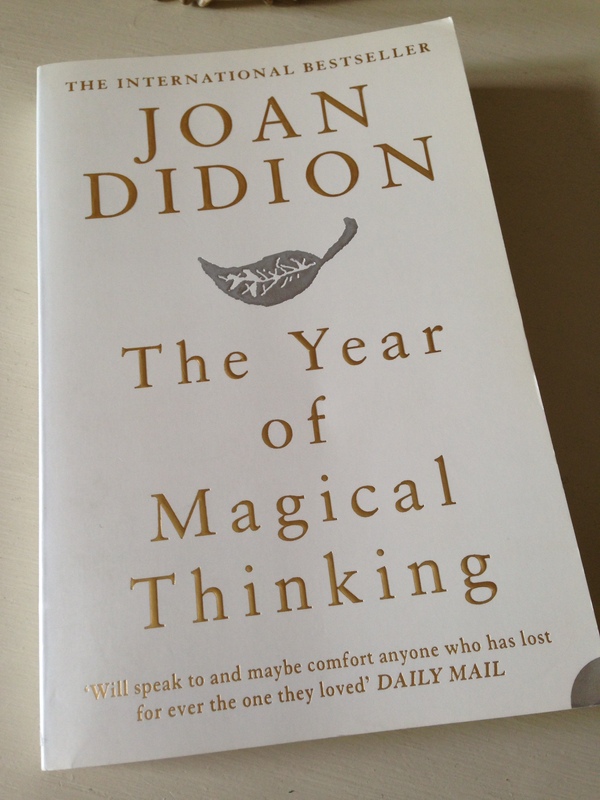 The Year of Magical Thinking charts Didion’s attempts to make sense of the weeks and months that followed these tumultuous events in her life, a period that swept away any previous beliefs she had held about illness and death and grief, about probability and luck, about marriage and children and memory, about life itself. It is a deeply personal exploration of these concepts, all written in Didion’s signature style, that of the cool, perceptive, surgically-precise chronicler of our times. In an attempt to make sense of the range of emotions she is experiencing, Didion begins to explore the literature on grief, turning initially to poetry, novels and memoirs. Given that grief touches virtually all of us as some stage in our lives, there is surprisingly little coverage of it in the sources Didion finds close to hand. Perhaps unsurprisingly, the most illuminating insights into grief come from Didion herself. In this passage, she distinguishes between our image of what grief will be like and the reality of actually experiencing it for ourselves, a description that rings completely true to me based on my own experience of loss. Didion is also very good on the feeling of utter disorientation and dislocation that follows the death of a loved one, that fuzzy, ‘mudgy’ state of mind that perhaps only others going through a similar experience can fully recognise. There is clear sense of fragility and vulnerability here. Intercut with these reflections on bereavement are Didion’s examination of her life with John, in particular, the years they spent in California and their time with Quintana. She describes how even the smallest of objects – often chanced upon at the most unexpected of times – can trigger the vortex effect, the opening up of a tunnel of memories that catapult her into the past. While glancing at a TV commercial, Joan happens to catch sight of a familiar stretch of coastal highway – all of a sudden she is back at Palos Verdes Peninsula, immersed in memories of the house where she and John lived with Quintana when she was a baby. Reflections from the months leading up to John’s death form another focal point. There are a number of occasions when Joan wonders whether John had sensed that time was running out for him. In the autumn of 2003, John persuaded Joan that they should take a trip to Paris as he feared that if they did not go then, he might never see the city again. Moreover, when she thinks back to the time shortly before his death, Joan recalls John saying several things about his current and previous work which, at the time, made it difficult for her to dismiss his mood as depression (something she considers a typical phase of any writer’s life). Here is just one example of the things that continue to gnaw away at her. It was either the evening of John’s death or the previous night; John and Joan were travelling home in a taxi having just visited Quintana in the ICU unit at Beth Israel North. Everything he had done, he said, was worthless. I still tried to dismiss it. This might not be normal, I told myself, but neither was the condition in which we had just left Quintana. He said that the novel was worthless. I don’t think I’m up for this, he had said in the taxi on our way down from Beth Israel North that night or the next night. He was talking about the condition in which we had once again left Quintana. You don’t get a choice, I had said in the taxi. ‘Did he have some apprehension, a shadow?’ These questions and more continue to haunt Joan as she tries to make sense of John’s death, prompting a re-examination of life with her husband as she had previously understood it. Magical Thinking is a remarkable piece of writing, at once utterly compelling, deeply affecting and emotionally truthful. (There are other threads within Magical Thinking which I haven’t even touched on here, most notably Joan’s account of Quintana’s illness and its impact on her own state of mind.) 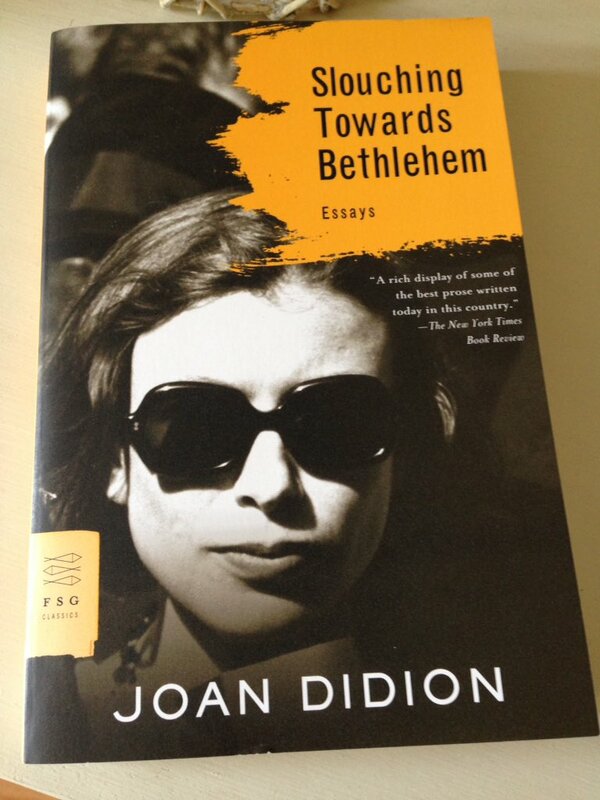 Didion brings a great deal of honesty and candour to this work. She is relentless in her questioning of herself and of others, constantly seeking to understand what was said, what was felt, what might have been. Certain questions are left unanswered, doubts remain in the mind; and yet there is a sense that the very process of writing this book has helped Didion in some way. As is often the case when I try to write about a favourite book, I am left feeling that I have fallen short, that I haven’t done it justice, that I have failed to articulate what makes it special. All I can say is that this is an exceptional book. I couldn’t help but be reminded of Delphine de Vigan’s autobiographical novel, Nothings Hold Back the Night, a book that made my ‘best-of’ list last year. The Year of Magical Thinking is published by Harper Perennial. Source: personal copy. This entry was posted in Book Reviews, Didion Joan and tagged #ReadWomen, Book Review, Harper Perennial, HarperCollins, Joan Didion, Memoir, Non-fiction, US on April 26, 2016 by JacquiWine. 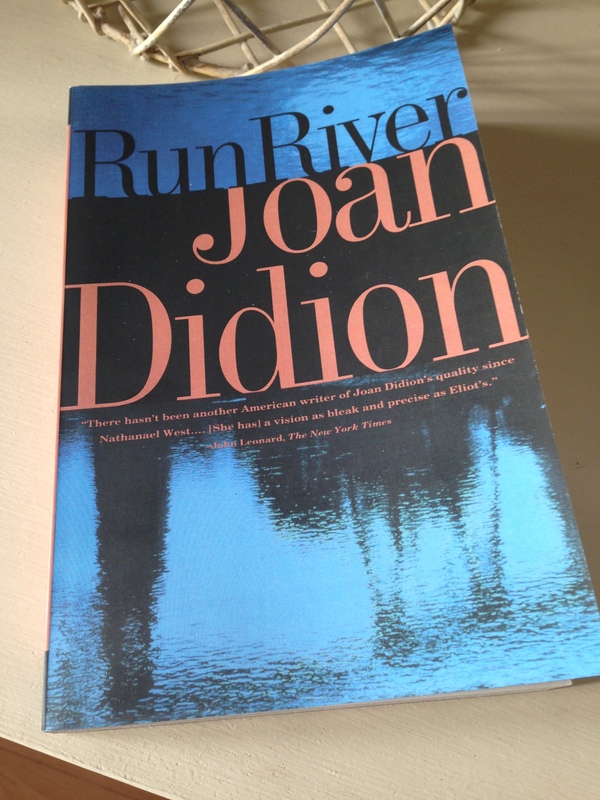 Earlier this year, I read Joan Didion’s debut novel Run River. I loved the characters, the melancholy tone of this novel, its sense of place…I didn’t want it to end. All this left me keen to read more of Didion’s work, both her fiction and non-fiction. 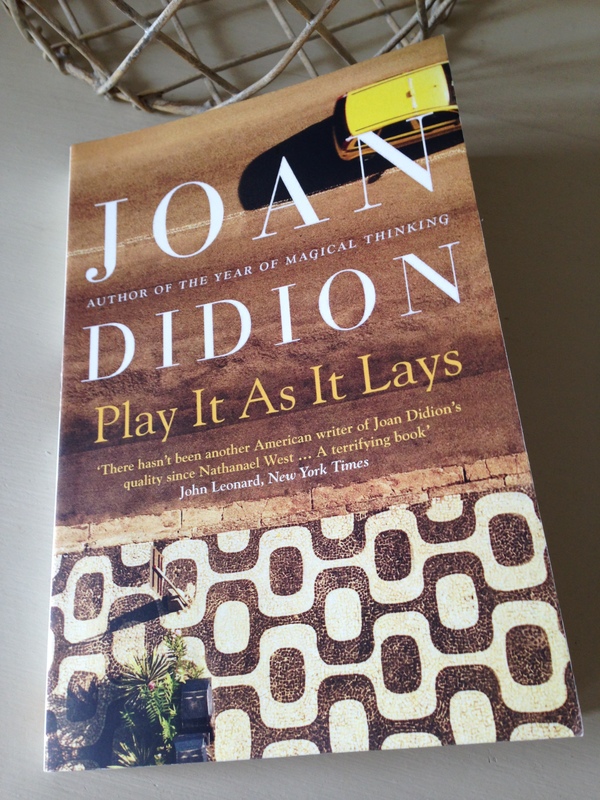 First published in 1970, Play It As It Lays was Didion’s second novel. It’s very accomplished, but it’s also very intense – a searing novel with a harrowing story at its heart. Maria tries to play along with the psychiatrists, to be ‘an agreeable player of the game,’ even though she knows they will misinterpret the facts. They wish to formulate reasons for her behaviour, make connections where none exist – that’s their job. The people at the institution are interested in her past, but Maria has trouble with her life ‘as it was’. She knows it doesn’t lead anywhere. The majority of the remainder of the novel takes the form of a sequence of short, sharp chapters on the ‘as it was’. These are mostly written in the third person, which gives the story a sense of veracity and detachment as if we are observing snapshots of a selection of scenes from Maria’s past. The supposed reason for Maria’s confinement is revealed in the second chapter, a brief statement from one of Maria’s friends, Helene. But that’s not the most important thing about Maria’s story; at least I don’t think it is. Maria’s world is diffuse and disordered; it’s populated by shallow friends, people like BZ, the film producer and his wife, Helene. Didion perfectly captures the mood of the period. It’s there in the description of the crowd Maria encounters at BZ and Helene’s parties: the ‘sulky young men’ BZ has met on his travels to Tangier and Acapulco; Helene’s friends complete with their Pucci silk shirts, ‘periodically tightened eye lines’ and ‘husbands on perpetual location’. Always when he came back he would sleep in their room, shutting the door against her. Rigid with self-pity she would lie in another room, wishing for the will to leave. Each believed the other a murderer of time, a destroyer of life itself. She did not know what she was doing in Baker. However it began it ended like that. “Where’ve you been,” he said. Following her split from Carter, Maria spends her days driving the California freeway. She has to be on the system by ten o’clock otherwise the day’s rhythm is all out of whack. She drives anywhere and everywhere; it creates an impression of momentum. Sometimes the freeway simply runs out leaving Maria in ‘a scrap metal yard in San Pedro’ or out in the middle of nowhere where the scorching roadway just stops. It’s an image that highlights the emptiness of Maria’s days at the wheel. Like Run River, I can’t imagine Play being set anywhere other than California. Didion gives the reader a vivid feel for the landscape: the images of distant mountains; the arid heat of the freeways; the diners and thrift marts dotted along the way. Play It As It Lays is a hard novel to describe, but it’s good; it’s blisteringly good. At times the prose and imagery are so intense they pierce the consciousness like a needle. Didion seems to have an innate ability to get inside the minds of women on the edge, women who are isolated and distanced from those around them. She writes about fragile, disconnected lives in a way that seems so raw yet strangely polished at the same time. At one point in Play, there’s a scene where Kate (Maria’s daughter) smashes a china doll against a large mirror – the floor is covered with pieces of ‘broken mirror and flesh-coloured ceramic’. It’s a metaphor for Maria’s existence, for the novel itself: a life fractured into a multitude of tiny jagged shards. I’ve been reading this novel with Emma at Book Around the Corner – Emma’s review is here. It was Max’s review that prompted us to read Play. Play It As It Lays is published in the UK by Fourth Estate. Source: personal copy. 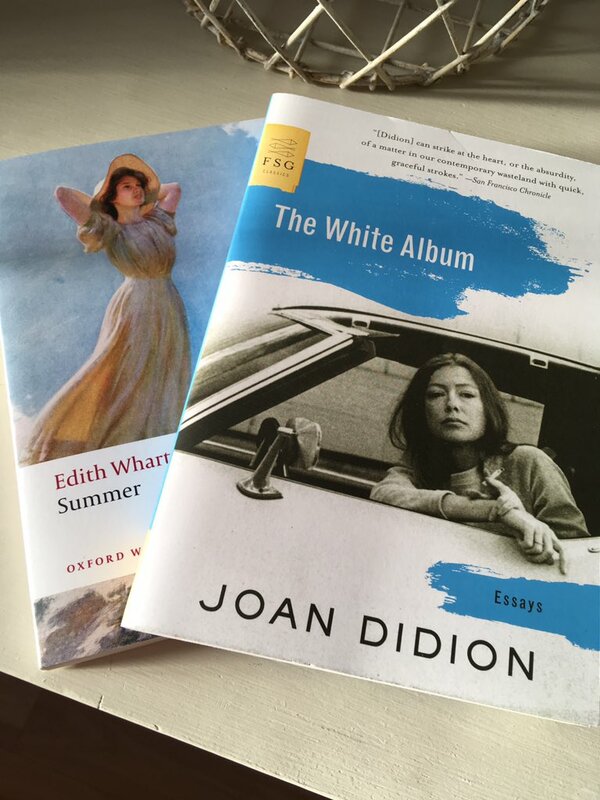 This entry was posted in Book Reviews, Didion Joan and tagged #ReadWomen, #ReviewWomen2015, 4th Estate, Book Review, Joan Didion, US on May 20, 2015 by JacquiWine.